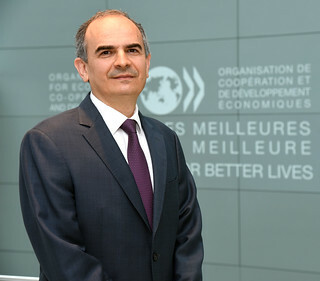 Ambassador Erdem Başçı took up his duties as Permanent Representative of Turkey to the OECD on 30 May 2016. Mr. Başçı was born in Ankara in 1966. He holds an honours degree in Electrical and Electronics Engineering from the Middle East Technical University, an M.B.A. and an M.A in Economics from Bilkent University as well as a second M.A. degree in Economics from Johns Hopkins University. In 1995 he obtained a Ph.D. in Economics from Bilkent University. Between 1995 and 2003, Mr. Başçı worked as an Assistant Professor at Bilkent University in the Economics Department, and in 1999 he was promoted to the rank of Associate Professor. Monetary economics, financial economics, macroeconomic theory and mathematical economics were his research and teaching areas. Mr. Başçı lectured at the University of York, UK as an honorary visiting fellow in 1999. Mr. Başçı's academic papers have been published in Oxford Economic Papers, Journal of Banking and Finance, Journal of Economic Dynamics and Control, and Journal of Mathematical Economics. He also co-authored various chapters in books published by Springer-Verlag and Palgrave. Besides his theoretical contributions to the economic literature, Mr. Başçı has academic publications on the Turkish economy as well. In October 2003 Mr. Başçı was nominated Deputy Governor of the Central Bank of the Republic of Turkey. From 2011 until his appointment as Permanent Representative of Turkey to the OECD, Mr. Başçı was Governor of the Central Bank of the Republic of Turkey. Ambassador Erdem Başçı is married with three children.